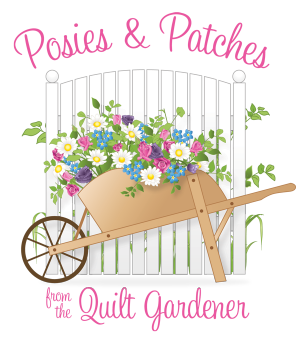 Welcome to Homespun Hearth's Quilted Gardener! We hope you will join this elite group of gardeners -- those who love the smell of fresh-cut flowers, but don't have a green thumb! Please accept our invitation to join our elite club! 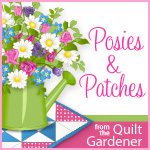 We know you will enjoy creating your very own garden of quilts all year long. Inch by Inch, Row by Row, you will Sew, Sow, Sew yourself a wonderful garden each and every month! Developed by Teresa from Homespun Hearth for the FabShop Network, we have taken the program to the next level and we are so excited that we could offer something to you that would be perfect for your time and budget. Plus, we take the headache out of selecting the perfect seeds (fabrics) for your quilts each month! Bonus: Each month we also give you some ideas for your outdoor garden, too! Complete Quilt-of-the-Month Program: Every month members receive a Lap or Queen size quilt (or, alternate each month as requested). There is a $25 non-refundable membership reservation fee for the program. Members enjoy a 10% reduction in the cost of each quilt, including the backing costs, plus the guarantee that they will receive their selected quilt size each month. The kits for this entire Quilted Gardener program are made with only the finest from Art Gallery Quilt Fabrics, and full-color, easy-to-follow patterns are included. Each kit includes the fabrics for the entire quilt top, including binding. Coordinating backing fabric is optional. We have 12 gorgeous designs with a variety to inspire even the most savvy quilter. We have the easier quilts (single posie), intermediate quilts (two posies), and advanced quilt (three posies) -- the harder the quilt, the longer it will take to put together (in reality, none are particularly hard, especially given the easy-to-follow instructions). The easiest of quilts should take about 4 hours for the smaller Lap size quilts. After all kits have shipped, any remaining kits will be offered to the general customer base, however member pricing is 10% lower than general pricing on these kits. The pattern will be available for download for that entire month. This Program includes all 13 designs in each of the two size options for a Flat Fee of $90 for the set of monthly downloads. This is an overall savings of approx 50% over the individual purchase price of $12 per pattern plus shipping costs. Individual Monthly Pattern Download Purchase: If you would prefer to pick and choose your designs each month, the individual cost of the pattern download is $9.99. Once purchased on an individual basis, the download will be available in your account. These designs will be released on a monthly basis. Individual Monthly Pattern Shipped Purchase: If you would prefer to pick and choose your designs each month and to have a hard copy sent directly to you, the cost is $12.99 per copy plus shipping. These designs will be released on a monthly basis.